A Giant Double Chocolate Cookie exploding with rich chocolate and a delightful taste. A decadent chocolate cookie that is definitely for the chocolate lovers at heart! On what kind of level do you LOVE chocolate? In my home, I have only one intense chocolate lover. The others (including myself) could really care less about chocolate. Easton is our official chocolate lover in the family. He has the pancakes drenched in chocolate every chance he gets… with his sweet and innocent so-called begging. And, can live off the pan of brownies for every meal… as he sniffs them out hiding on top of the refrigerator. This recipe makes 2 nine inch Giant Double Chocolate Cookies. Enough chocolate cookie action to share with your favorite neighbor or devour yourself. These chocolate cookies are intensely doused with double the chocolate in every crevice. A swooning eye roll with every bite. Yes, these cookies are that delicious! When Easton’s chocolate sniffer woke up and sniffed out these cookies this morning, he was up and ready to check out the situation. One cookie sitting out to cool in the kitchen, while the other is being photographed here. Within minutes being away from the one cookie that I thought was left stranded alone in the kitchen… was now almost 3/4 gone! The chocolate lover was awoken by the sweet aroma of fresh baked chocolate cookies. How could you resist fresh baked cookies first thing in the morning? I know Easton’s little chocolate craving couldn’t! Whisk together the flour, baking cocoa, and baking soda in a medium mixing bowl. Melt butter in a large sauce pan on medium heat. Take off heat and add 1 cup of chocolate chips and stir until melted. Pour sweetened condensed milk into the melted chocolate mixture. Add vanilla, egg, and egg yolk. Stir until completely combined. Gently fold in the flour mixture into the chocolate in the sauce pan. 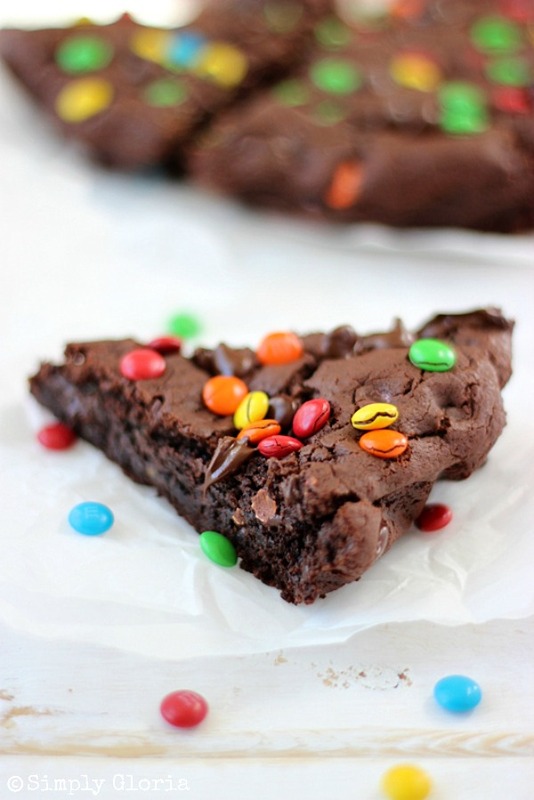 Once all combined, stir in the rest of the chocolate chips (and M&M's). Makes 2 nine inch cookies. Cover and stays fresh for up to 4 days. « Show Stopper Saturday #45 ~ Gourmet Burgers and Sandwiches! If you can believe this, I didn’t like chocolate for about the first 20 years of my life! Luckily, I met my husband and my tastebuds changed very quickly. Now I would love a big slice of this cookie. It looks incredible, Gloria! I want this all to myself al la mode, all that chocolate!! Oh my! These look super yummy Gloria! My kiddos would appreciate these too I am sure. I am gonna try these soon, I think. pinning. Thanks for sharing! Have a great week! I always end up eating whatever I photograph. In this case, it would be completely worth it! Your third photo (ohmygosh) is amazing! 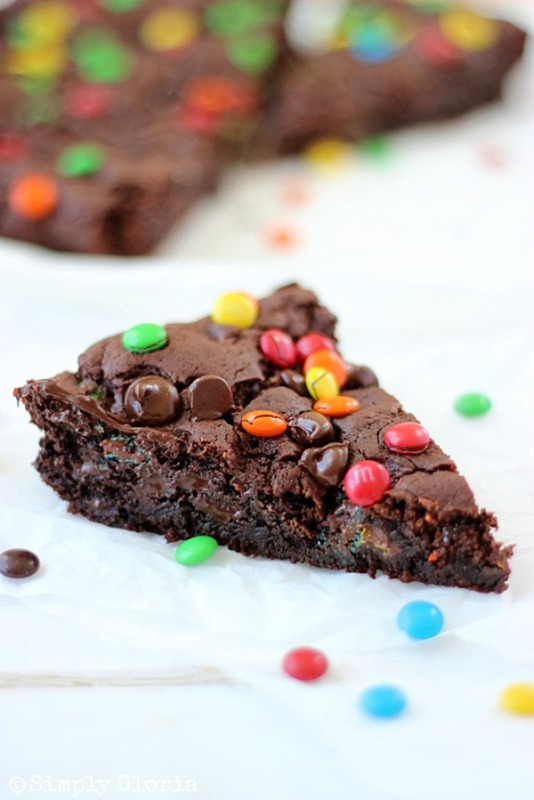 Love how deep and dark and fudgy the cookie base is and how it makes those MnM’s pop! You are talking to my chocoholic heart and it is listening gladly 😉 Pinned! You are so sweet, Mary Frances! These are pretty close to a brownie texture… because I’m all about a soft cookie! Oh my wow!! That cookie looks amazing! 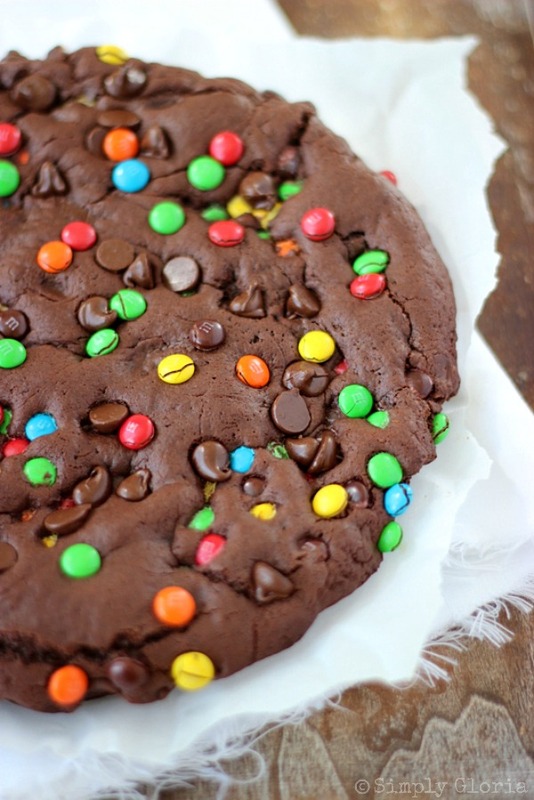 I’ve always wanted to make one big giant cookie and now I think I’m gonna have to!! 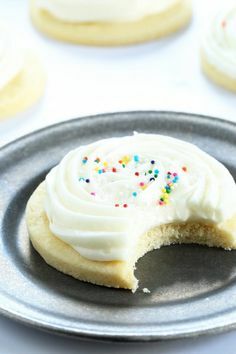 Shannon, I usually do cookies like this (in the pie pans) when it’s late at night and I don’t have anything out for the milkman… so this is fast and works great! Pancakes and chocolate syrup?!! Umm…Rudy’s dream come true! Oh and by the way Rudy would totally say this is the Realest cookie ever!!!! That is the cutest thing Rudy says! 🙂 Makes me smile! That’s right, Andi… just for you! I know, I’m weird like that! lol I’d definitely LOVE to trade you for your amazing baked donuts! I know at least one of my boys would likely devour this entire cookie. All of his favs! Simply Crazy is what this is 🙂 Seriously, I love it. My oldest just asked for basically a Brookie, he just thinks it’s his own invention though, and I was wondering what to use for the bottom brownie part. I think this cookie would be perfect then top it with a basic chocolate chip cookie dough then of course decorate. This looks delicious! Paula, that is too funny! What a great idea with using this as the bottom part… you’ll have to share the experience… then I can use your top part recipe! …MMM, oh Gloria, looks delicious! 🙂 Would be good al la mode 🙂 love ice cream with a little chocolate syrup and caramel on top!! Check out my recent post; Homemade Churned Ice Cream! Oh yes, it’s my favorite way to have this! Thanks, Michael! This is dangerously amazing! For when I just need chocolate! How amazing is this cookie?!? I happen to be a big fan of chocolate, and that ooozing chocolate in your photos is making me drool!! And seriously?! This recipe makes two of those big cookies?! This is sooo dangerous! My chocolate-loving heart is going pitter-patter :). No words go better together than giant chocolate cookies. I am pretty sure I could devour that entire cookie all by myself. Looks amazing, Gloria! This cookies OUTRAGEOUS Gloria! I just love it! And I love how your little guy is such a chocolate lover – he would do well in our house 🙂 Pinned! We both had giant double chocolate cookies on the brain – I can’t wait to try yours with the sweetened condensed milk, that stuff is magical! Gloria just saw this and repinned it! 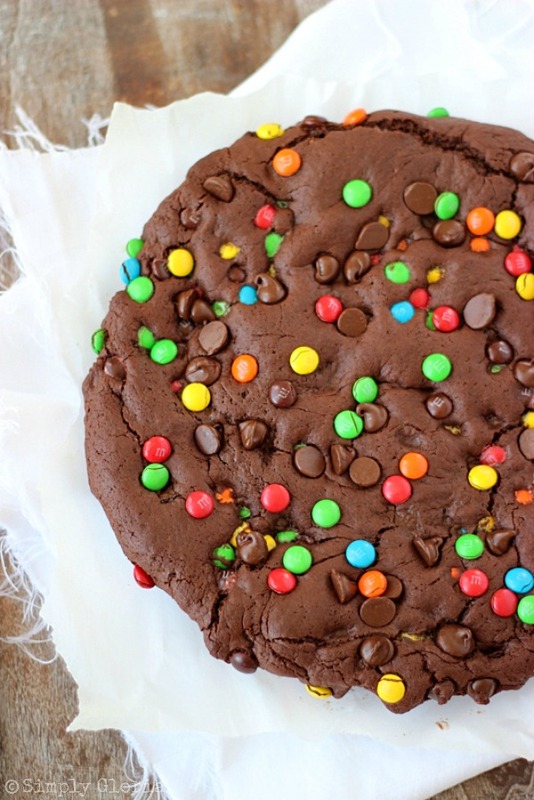 Love big cookies and this one looks like a winner. Sweetened cond milk is a new one for me in a cookie like this and love the idea! I’m with Easton! 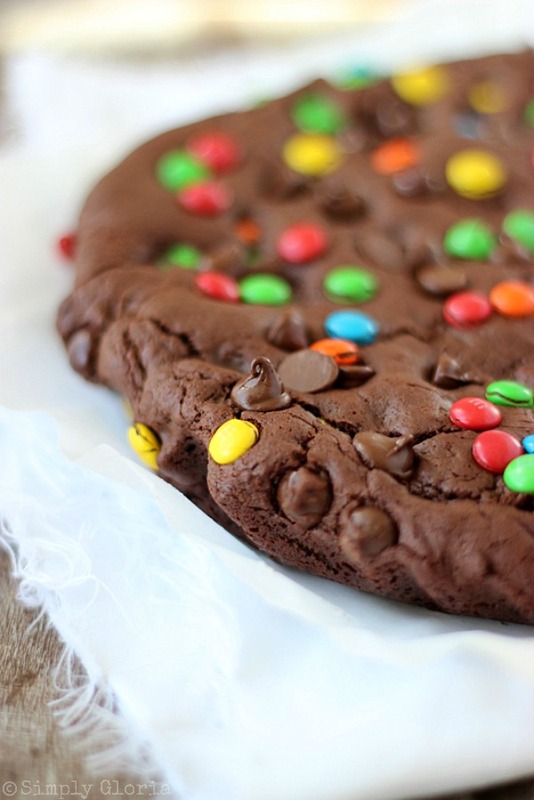 I would sneak these giant cookies away to gobble them up all by myself! Pinning and making! Wow, I wish I could eat these for every meal! Part of a balanced, happy diet! They look amazing. Nothing beats a giant cookie. And I mean NOTHING. Wow. This looks so tasty. Have to limit chocolate due to a health condition, but this looks so tempting. I’d be thrilled if you’d link up at this week’s Off the Hook! Oh my gosh this looks like the greatest cookie on the planet!!!! YUMMM!!!!! This looks absolutely delicious! nothing better than DOUBLE chocolate 😉 yum!